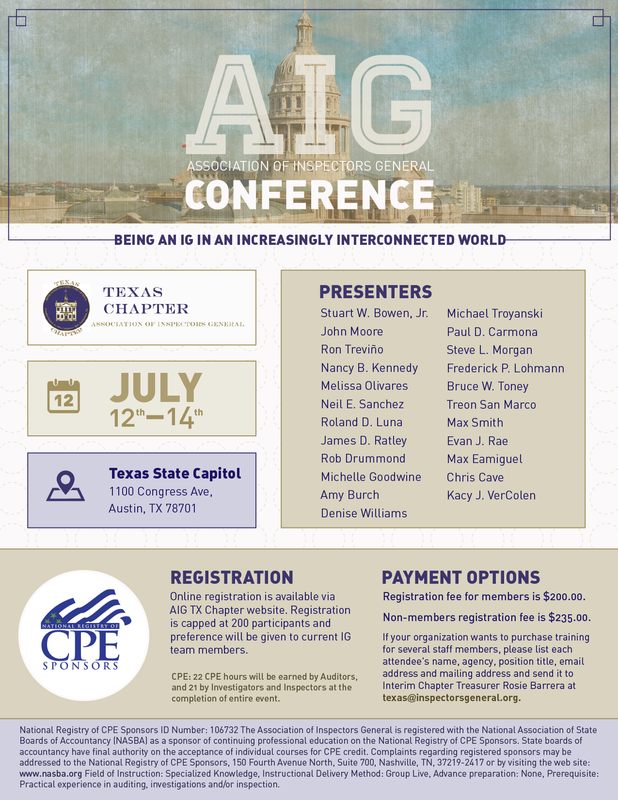 Select one of the following options below to Register and Pay for the Texas CPE Training Event from July 12 to 14 at the Texas State Capitol. Entrance is off E. 12th St. or E 13th St.; Exit is onto San Jacinto Blvd. For any questions, contact texas@inspectorsgeneral.org. Agenda for the CPE Training – note: Lunch is on your own. 8:00AM – 9:00AM IG Oversight in a Managed Care World Stuart W. Bowen, Jr. The Capitol Grill is located in the Texas State Capitol on 1400 Congress Avenue. It is open to the public and can be found in the Capitol extension in room E1.002.